Living in New York City, the century old subway transit system is part of the daily commute for about six million people. This complex system is critical to setting the pace of the city, shuttling people throughout the metropolis. Each train’s distinct path and destination is defined by a one-letter (or number) code, taking an express or local route. Now think of a parallel nanoscopic transit system where a molecular vehicle can be encoded by different chemical input codes, which instruct it to take a unique supramolecular pathway, resulting in time-dependent display of functionality. Reporting in Nature Chemistry, Mohit Kumar et al. from Rein Ulijn’s research group at the Advanced Science Research Center (ASRC) at the Graduate Center of the City University of New York reports such a system, where different amino acid represented by their single letter code K, E, S, L, Y etc. (lysine, glutamic acid, serine, leucine, tyrosine) dictates the supramolecular trajectory in a time programmable manner. The materials of the living world contain numerous examples of structures whose functionality is controlled by connected chemical reactions, and in response to small molecule metabolites. This enables living materials to be nimble and change properties as required, by consuming chemical fuel, and then degrade over time. Our supramolecular transit system is in some ways a synthetic analogue of such material with dynamically controlled function. The different pathways that may be followed depending on amino acid inputs present a further step toward the formation of materials that are supported by a metabolism, or a map of connected reactions of build-up, breakdown and reconfiguration. In this paper, we wanted to go beyond showing the formation and breakdown of structures in response to metabolites, to demonstrate controllable changes in functionality, specifically time programmable electro-conductance. Our design consists of the self-assembling Naphthalenediimide (NDI as vehicle) based organic semiconductor functionalized with amino acid (tyrosine) at both ends. Upon enzymatic activation, to control build-up and breakdown of nanostructures, along with addition of one of a number of amino acid amides, we could show chemically encoded, and time programmable self-assembly with temporal control. For example, upon addition of E (glutamic acid) it follows a supramolecular track starting from 2-dimensional sheet which transforms into helically organized fibers in 3 hours (a comparatively fast process, like the express track). Beyond this point, a slow degrading reaction takes over and the pathway continues to the formation of particles as terminal station in 2 weeks’ time, resulting in controlled loss of structure. By contrast, changing the encoding amino acid to L (leucine), we observe a molecularly encoded chemical trajectory going through achiral fibers (intermediate station) and helical tubes (destination) in a time controlled manner. In collaboration with Nicole Ing from Allon Hochbaum’s lab at Samueli School of Engineering, University of California, Irvine (UCI), we could show that these systems show time-dependent electro-conductance that is directly correlated with structural transformation. The E encoded fibers show enhanced electro-conductance over time, which was subsequently lost upon degradation of the fibers. For the L encoded system, a gradual and slow build-up of conductance was observed in line with the formation of the chiral nanotubes. Excitingly, the different instructions provided by various amino acids, allowed us to select inputs and obtain complex tracks, akin to trains having multiple possible routes, all encoded by the chemical nature of amino acid. Such a time and pathway programmable conducting nanostructure may be developed further to provide a space/time-programmable soft electrical interface for neuronal cells for future seamless brain/machine interfacing. 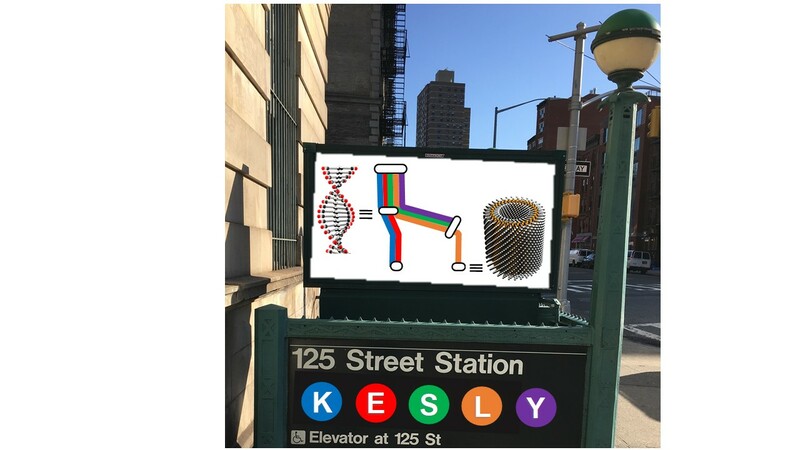 While the level of complexity obtained in the molecular transit system is still limited, and not all paths are currently reversible, the incorporation of a metabolism in materials design may one day power materials, like the New York subway powers the metropolis. Welcome aboard the “Supramolecular Transit System”, the subway network goes nano!